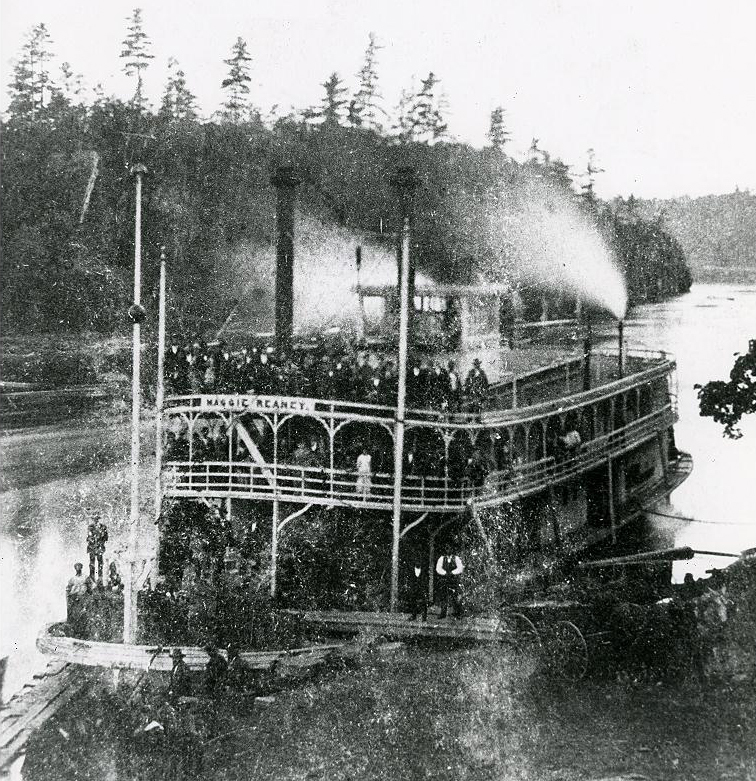 Her stroke came from the Marietta Manufacturing Company and she was built with an Oregon fir hull. Captain Steve Davis did job towing and named the boat for his mother. 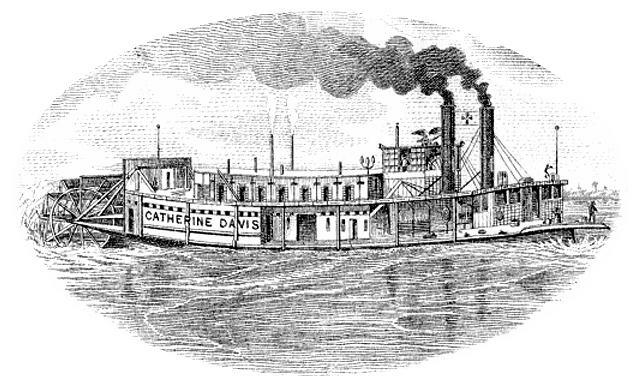 The name "Catharine Davis whistle" was used on all boats built by Captain Davis. 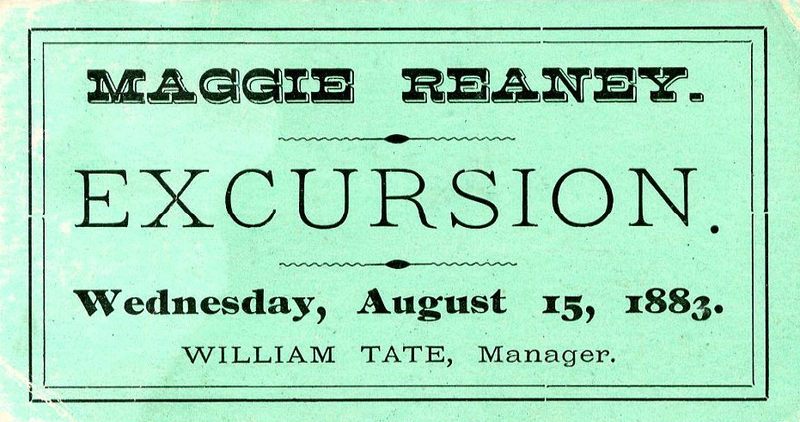 First trip was on June 12, 1896 from Marietta to Pittsburgh. Once bought by Smiley Towboat Company, she towed timber out of Big Sandy. On October 29, 1910, while working in Huntington Harbor, she struck an obstruction in the channel, tearing a hole in her bottom at the aft end of the boilers. She sank in 7 feet of water below Ninth Street at Huntington, West Virginia. Island Creek used her in towing between Huntington and Cincinnati and rebuilt her in 1916. 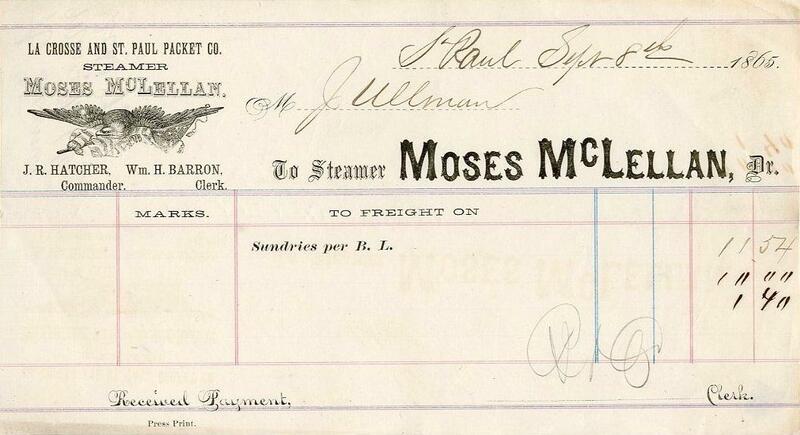 Original receipt for New Orleans Levee dues paid by "Cap't of Str Ella May" $27.20 for "4 trips" measuring 97 Tons at 7 cents per Ton from June 20th 1869 to June 29th 1869.It is signed by "J.O. Landry" Controller and and the Collector's last name is White but I'm not sure how to interpret his first 2 initials.Fred Way doesn't list a boat named ELLA MAY from the 1860's, but does list a sternwheel ferry by that name built at St. Louis in 1903 that operated on the Missouri River and was still on the "lists" in 1918.The name Ella May may evoke nostalgia from fans of THE BEVERLY HILLBILLIES in which Donna Douglas played blond cutie Ella May Clampett. 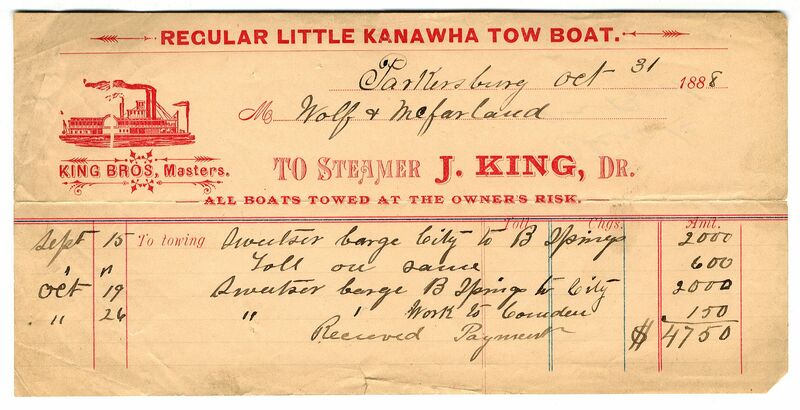 OCTOBER 31, 1888 WAYBILL FOR TOWING FILLED OUT AT PARKERSBURG, W.V. BELIEVE IT'S THE FIRST 'BILL I'VE OBTAINED FOR A TOWBOAT THUS FAR. Built in 1881 at Belpre, Ohio. Joe, Josh and John King of Belpre, Ohio. Jesse P. Hughes remembered the KING as still being in service as late as 1898. Built at Cincinnati, Ohio in 1855. Named for Capt. McLellan who was master many years on TELEGRAPH NO. 3. Designated a low water boat for the U.S. Mail Line, Cincinnati-Louisville, November 1855, along with the CITY OF WHEELING. Ran with some regularity in the Cincinnati-Memphis trade, Z. M. Sherley, continued as manager into the year 1860. Made a trip to Pittsburgh with cotton January 1861 under Capt. Knight. Delivered U.S. Army supplies to Camp Piatt, at Malone's Landing about 15 miles south of Charleston on the Kanawha River in 1861, attracting much attention due to her size. Departed Pittsburgh Apr 1, 1862, with passenger and freight for the Upper Mississippi having been sold there. Rebuilt at Madison, Indiana in 1862. Renamed CITY of St. PAUL on June 7, 1866. "Landing at a wood yard 45 miles above Fort Peck, I discovered the dead bodies of the proprietors, seven in number, supposed to have been killed by the Assiniboine Indians in retaliation for the murder of two of their tribe two months ago by wood-choppers in that same vicinity. The bodies of the whites killed were horribly mutilated and in a state of decomposition. I buried them as well as possible under the circumstances. Three of the bodies were outside the cabin, four within. The entire party came up with me this spring on the PENINAH from St. Louis and stopped at that point where they met their sad fate. Nothing was found but a few letters scattered around in the cabin, which I have delivered to W.I. Cullen, Supt. of Indian Affairs." (signed) Capt. Haney. Stw p wh b. Brownsville, Pa. , at Axton yard, 1891. Dismantled Catlettsburg, Ky. 1907, and her engines went in the towboat ENQUIRER. 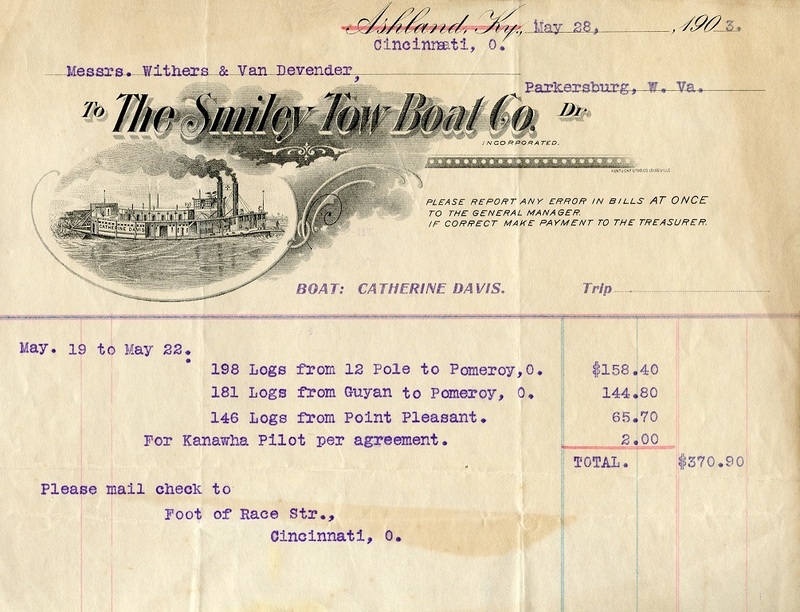 Sept 11th, 1869 waybill from LAURA No. 2 and photo of the boat (left foreground) with steamer HOPE behind her on far left and the large boat in the background the SAMUEL CLARKE. Photo from La Crosse collection. The hull built at Warren, Pennsylvania and superstructure completed at Elizabeth, Pennysylvania 1864. Built for Capt. R.B. Bell, Venango County, Pennsylvania. 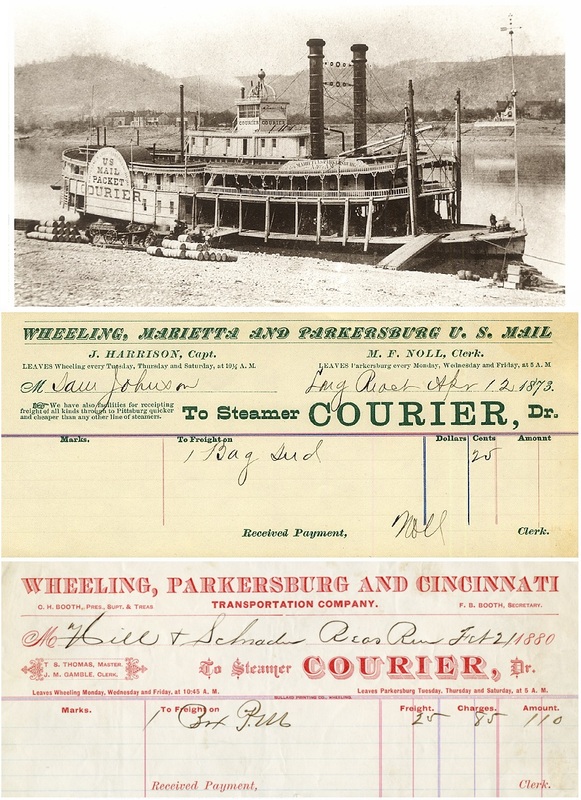 Ran on the Allegheny River to Franklin, Pa., and in 1869, was in the Wheeling-Clarington trade, and made trips up the Big Sandy from Catlettsburg, Kentucky. In 1871 was running Wheeling-New Martinsville during low water in August, while at the same time the SCIENCE and NEW STATE were running Wheeling-Parkersburg, and the W.F. CURTIS was running between Wheeling and Sunfish (Clarington). 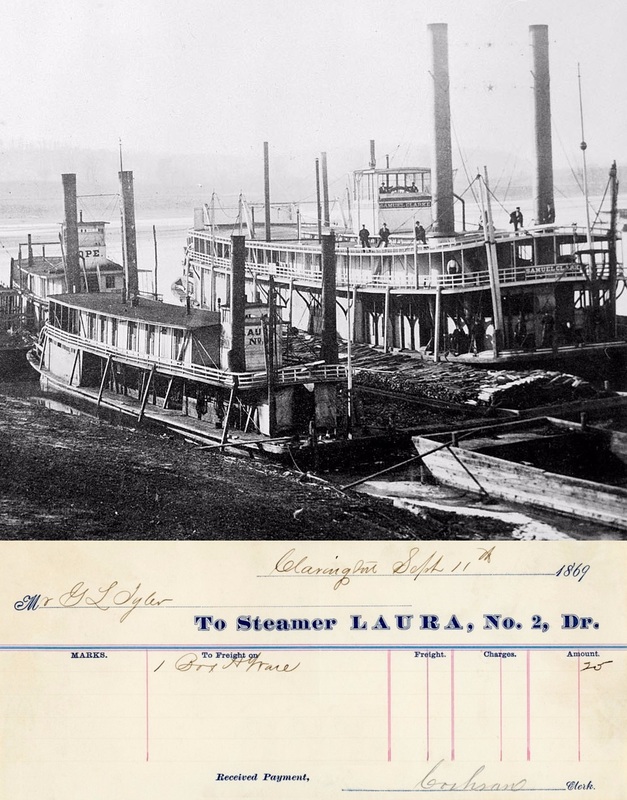 "An old looking craft," the DARLING, was running Wheeling-Steubenville. In spring of 1873, LAURA NO. 2 was in the Parkersburg-St. Marys trade. 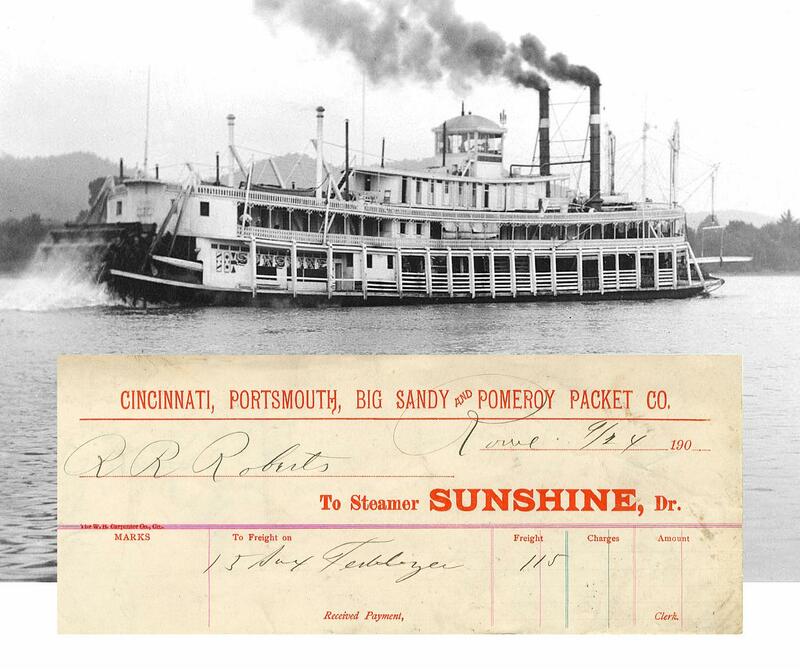 Her engines were from the REBECCA.The Ohio River Railroad opened on June 4, 1884 and the COURIER never made another trip in the trade after that happened. She carried a circus along the Ohio River in 1885 and that fall was laid up along the Kentucky shore at the lower end of Covington. Stranded the winter of 1885, all furniture and machinery removed and the hulk was burned.